"If there are no dogs in heaven, then I want to go where they went." It has taken me almost a year to be able to write this and get through it entirely. 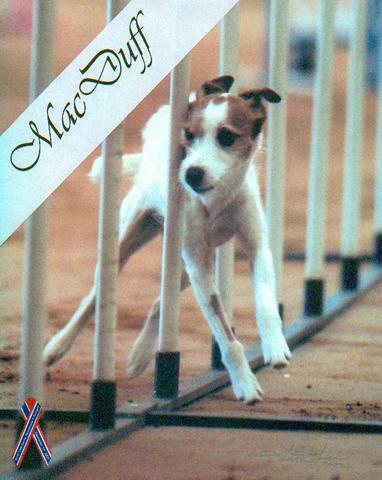 MacDuff was my heart dog, my first agility dog, my second JRT, my friend and partner for almost 17 years. His nicknames include Mac, MacBoy, Duff, Duffers, Devil Dog, Mackers and at times of being a real JRT, a few other choice words. MacDuff’s sire was Button Top Bill, one of Flo Clark’s dogs and out of Newmarket Sally by Briarpatch Jason. Even though we didn’t start agility until he was two years old, he earned many, many titles. In the beginning, he would do four obstacles, run off and hunt and, as we all know, that’s a JRT’s natural instinct. Before I found agility, I decided to come to a JRT trial. 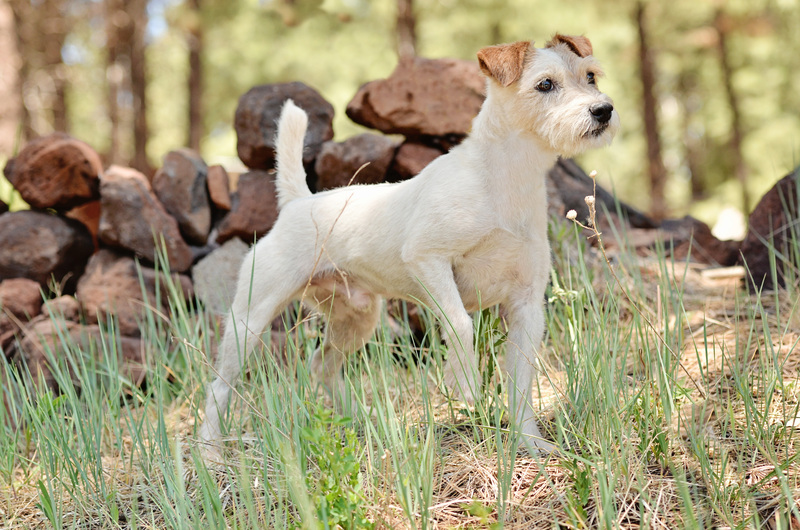 At that trial I met someone who really introduced me to the Jack Russell Terrier. That was, at that time, Barbara Adameic, now Dickinson and she and I became great friends, traveling to several JRT trials, including Nationals, together. She was thrilled that I wanted to not only do JRT things like Racing and GTG with my JRTs but agility and obedience. MacDuff earned his GTG certificates in 1997 and was Racing Champion several times until he started fighting on the track, so we quit racing. Barbara encouraged me to continue on the quest of teaching him obedience and agility. I persevered through his antics because I knew he really enjoyed agility and I was not giving up. I knew he was so talented that he could become a star. It took a while to train him in obedience, but eventually he really loved to do obedience along with agility. He was just such a happy dog when working with me, although he had this bit of aggressive tendency, but only when another dog got in his space. I learned how to manage that, and together we earned over 120 titles as lifetime partners in agility and obedience. The most memorable were his USDAA Lifetime Silver and Silver ADCH, his ASCA AtCH, his NADAC Natch. His other accomplishments included: Top Ten placements in USDAA for six years; 2004 All Around Performance at the USDAA Nationals, second in the 2005 USDAA Veterans Grand Prix, and he won a total of 9 JRTCA National Championships in agility and obedience. At the age of 16, he won his TMAG in Teacup Agility. But above all he was my baby boy, my heart and soul; we built a relationship that I never had with any other dog. He was the reason I got into agility and training dogs. He taught me so much and inspired me to learn more about training dogs. He was the inspiration for Gold Medal Dog Training Center. He never slowed down until he was about 13 or 14 but he could still make time on a USDAA course. As he aged, he became a bit of a grouch but aren’t we all as we age? This dog increased my love for Jack Russells, tenfold. I know now that I can never be without a JRT. I fell head over heels in love with the breed and it was because of MacDuff. He gave me comfort in time of loss and heartache, he snuggled beside me in my chair and in the bed, and he brought me much joy and happiness throughout the years. He would lick my tears from my eyes. If I had a bad day at work, a smile would come on my face when I opened the door to hear his greeting me. He nursed me through a divorce and some very hard and tough times. MacDuff gave me unconditional love. Ok, I just started crying again, but I’m trying to make them happy, remembering tears. So those people who say that dogs can’t do these things are totally wrong. To my friend and long-time companion, MacDuff, I want to say that I so miss you but I know you are in good hands, with my sister and mom taking care of you now along with the good Lord. I will see you again someday. I always tell my friends who lose their dogs that the reason God made dogs to live such short lives is so that we humans can enjoy and treasure more than just one dog in our lifetimes. I truly do believe that. MacDuff, I hope you are running, jumping, racing, chasing those varmints up there in heaven and having a ball. I love you and I’ll always miss you every single day. I first introduced Zoey to the JRTCA in the October 2007 issue of True Grit. I wrote a brief overview of how I got her, the trouble she caused in my life and ultimately our resolution to the turmoil. I would have never imagined that she would leave this earth as early as she did or the huge hole in my heart that she has left. She came into our life unexpectedly and made a big place in our hearts. She taught us what it was like to have a Jack Russell Terrier. She was very reactive and dog aggressive, but we worked things out. We enjoyed learning the sport of Jack Russell with her. 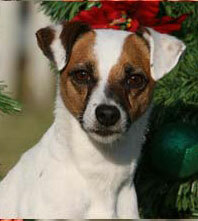 We attended local JRT shows and as we continued to learn the sport of Jack Russells, Zoey excelled. We soon were a force to be reckoned with. 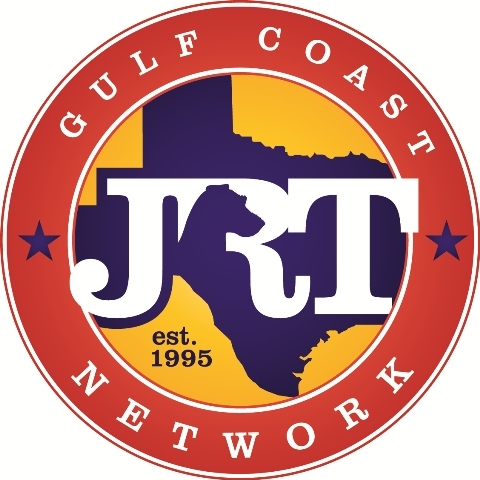 We attended the 2006 JRTCA National Trail and brought home 4 ribbons (one blue). We continued to attend local events and she won 4 Grand Champion GTG’s, a Reserve Super Earth, several Grand Champion Lure Coursing events. She loved to race, but being a 1/16” of an inch over, she had a tough time winning her racing classes. She almost always made it to the finals, but one of those “big” girls would eek out first place. She loved going to the ranch with me. Hunted whatever she could find at the tanks. She enjoyed her life with our pack. March 2009, we were involved in a horrific head on collision and a subsequent rear-end accident. I thought we were all going to be fine, but a year after that accident Zoey started to show signs of lameness. I took her to the vet, I took her to a specialist, I took her to a surgeon and nobody could tell me what was wrong with my girl. End the end she was diagnosed with Immune mediated Poly-arthritis aka Rheumatoid Arthritis. She survived a little over a year before she couldn’t move anymore. I buried her under a plum tree behind my shop so I can visit with her. We miss her so much and not a day goes by that I don’t think about what an enriching experience she was in my life.